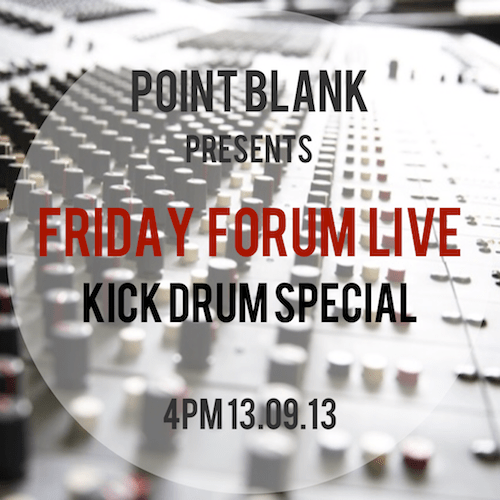 Its safe to say that the kick drum in dance music is the most important aspect of any track. As quoted by Eats Everything several months ago “dance music is 90% about the kick drum, 10% PR”, which here at BlahBlahBlah we thought was on point (no pun intended). One of the most common techniques of getting the perfect kick is layering two different types together, one for the punchy mid range and one for the subby low end. Although this technique is very effective, it is also extremely easy to get wrong. Fortunately Pointblank as always has a solution for people who are struggling to achieve the right results. JC Concato, head of Pointblank music college based in London will be doing a live session available to stream from youtube (see link below) at 4pm today. JC aims to iron out any bad habits or techniques by explaining the true methods on how to get the perfect weight and bite to your kick. You will also be able to ask any questions you want answered by posting on the comment section below the stream (A recording of the stream will also be available for those of you who can’t make it at 4pm). If sorting your kick is just the tip of the production iceberg we’d recommend checking out the extensive range of Pointblank Online Music Courses on offer, having completed a few of these courses ourselves we cant recommend them highly enough…….